Suffered from abdominal pain for weeks, a friend recommend Dr George Yang to me. First met Dr Yang in June 2016, promptly diagnosed the pain was caused by gall stones. Then he arranged the robotic gall bladder removal surgery right away. Surgery went successfully, almost pain free, I recovered within days, can hardly see the scars! This was my first surgery ever in the past 3x years, I was extremely worried when I realized surgery was the only method to treat my illness completely. 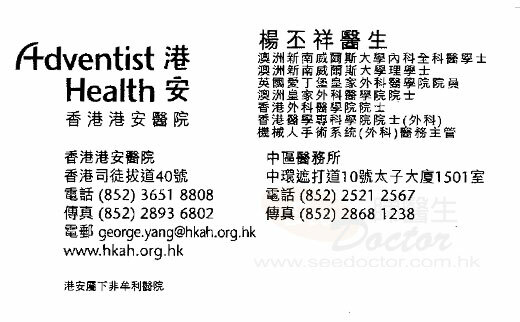 Dr Yang was being very patient at all times and explained everything to me clearly, his kindness and professionalism take all my concerns away. Highly recommend, superb!